Maria, there’s another candidate in your race who is free from the taint of Rex Sinquefield donations, and his name is Joe Adams. He was actually your mayor for several years, if you can recall. 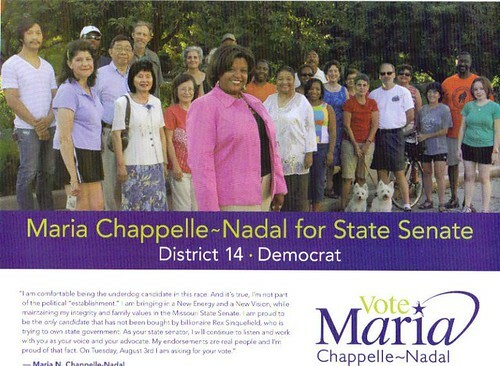 Maria Chappelle-Nadal, outgoing representative of the 72nd House District is running in a 4-way race for state senator of the 14th Senate District. 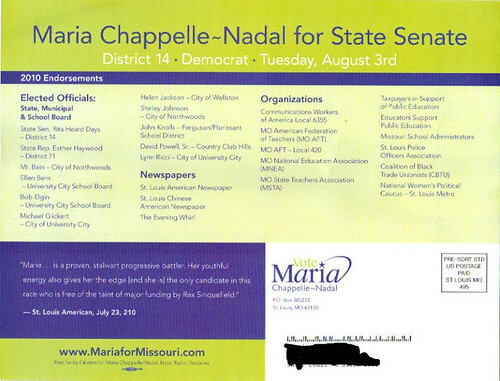 She just sent out mailers to her prospective constituents that mangle a quote from the St. Louis American (and that’s being generous) to claim that Maria is the only candidate who hasn’t received money from Rex Sinquefield. Joe Adams, the former mayor of University City, has not received any contributions from Sinquefield, and the original quote from the American in no way resembles Maria’s claim. In fact, the quote from the American explicitly states that Joe Adams has not taken money from Sinquefield. In other words, Maria’s mailer “quotes” the opposite of what the American said, and one can’t draw any other conclusion than that the quote was deliberately altered. Maria is flat out lying.